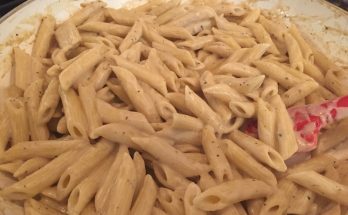 While this did begin solely as a cheese-tasting blog, we’ve clearly ventured beyond (what else could we do, with so many delicious vegan foods out there?). 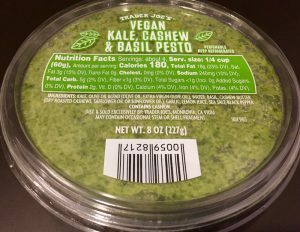 Thanks to an awesome vegan cashier at our local Trader Joe’s, we were introduced to this vegan pesto sauce, made with basil, kale, and cashews. She said we would love it, and she was absolutely right. 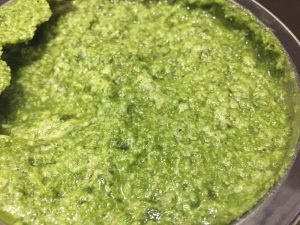 This pesto is pretty near perfection, for vegans and omnivores alike. The only thing missing is our beloved Follow Your Heart parmesan, which has mysteriously disappeared from every supermarket in our state. 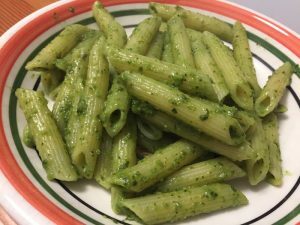 But this pesto is so good, we actually survived, lived to talk about it, and enjoyed it immensely. Thanks to Trader Joe’s for making this and so many other delicious vegan items, and please keep them coming! 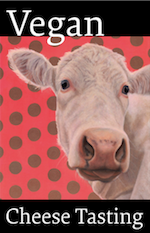 Midge Raymond is a co-founder of Ashland Creek Press. She is the author of the novel My Last Continent and the award-winning short story collection Forgetting English.